Steel construction has gained in use over the decades thanks to major advancements in both technology and efficiency. From bridges and schools to cars and artwork, modern steel is a versatile product that relies on extreme strength and resilience to bending, breaking, and so on. Because of this advantageous strength, services such as steel frame construction can be considered pretty hazardous. When you are looking for a steel fabrication company that can provide the best services and outcome for your project, you need to find a team of contractors who have the experience, equipment, and focus on safety needed to get your job accomplished on time and on budget. Sanilac Steel has proudly served as your steel erectors for Michigan projects since 1967. Our team focuses on delivering reliable results with honesty, integrity, and safety above all other goals. We’re dedicated to keeping your site running as safely and as efficiently as possible. Our stringent training revolves around minimizing risks and avoiding costly mistakes. Today, we’ll highlight a few of the top dangers present during structural steel erection. If you’re in need of a team that is dedicated to your success as you are, be sure to reach out to our steel fabrication company in Marlette to learn more! Steel structure building is an intensive process that involves numerous moving pieces all working in tandem to create an optimal result. One aspect that cannot be avoided is working at height. It is stated that workers who are six feet above the ground are at risk for fatal injuries, which is one scenario that no contractor wants to see. Fall concerns are prevalent in the construction industry, but when it comes to steel frame construction, the risks may be even more apparent. Inspecting the floors. On a job site, the floors and scaffolding of your project may be littered with tools and other tripping hazards. Not only does this cause a major safety risk for you up on the platform, it also puts others down below at risk of being struck by an object. Our team works to ensure that all flooring in place is strong, sturdy, free from clutter, and dry and clean to avoid slips. Having floors that are level and steps that are clearly marked can go a long way in preventing trip dangers. Stabilizing equipment. Beyond the floors of your job, the collection of ladders, platforms, planks, and tools all need to be properly placed to avoid any slips or fall dangers. Protective barriers should be in place where needed and railings should be secured to provide safe passage. Highlighting dangers. Working at height brings an inherent risk of falling through any gaps or unfinished sections in the floor. Any open pits you find must be covered when not in use and clearly marked to help others avoid any fall dangers. Fall arrest gear. One of the most beneficial investments to keep your crew safe in elevated work environments is to provide the best fall restraint systems in the industry. Harnesses with shock-absorbing straps can help to mitigate the damages of falling to the ground below or being hurt from the fall arrest. In many cases, fatalities are reported due to a failure to utilize proper harness measures. Proper training. 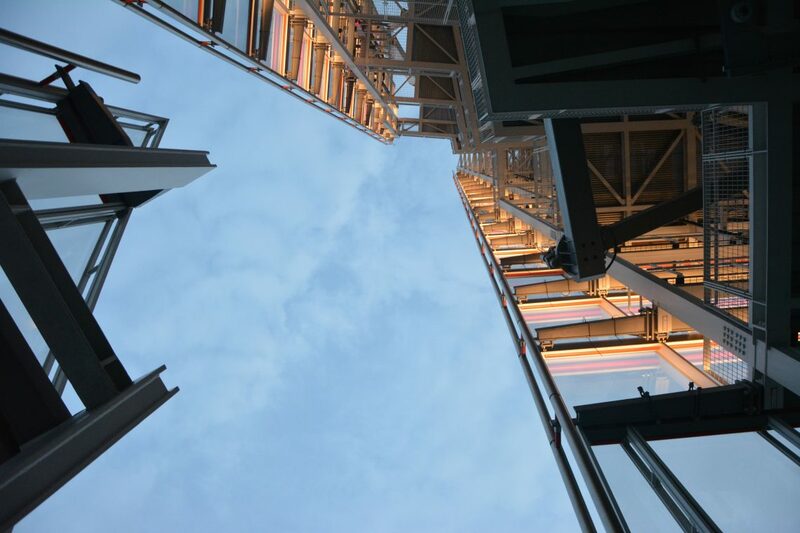 All of these preventative measures can be for nothing if your team is not properly trained in the safest practices when performing steel erection services. Sanilac Steel places a premium focus on optimal safety, and our employees are trained to spot safety concerns on the job site and address them before any bad results happen. The larger your building project is, the more heavy machinery will be needed on-site to get the job done. From the remote-controlled mule that compacts the dirt to massive 870G excavators that weigh nearly 200,000 pounds, every piece of machinery represents a real danger for workers on the site if the proper precautions are not met. Even when your workers on the ground are as safe as possible, risks still remain due to faulty equipment, missing safety features, or poor site planning. Inspecting the machinery. Any equipment that is dealing with mechanical issues can be considered a safety risk. Our crew will regularly inspect all utilized equipment to ensure that all of our machines will work safely when the time comes. Wearing the right clothing. Driving a loader can make it difficult to see people on the ground below, which is why reflective safety wear is a must. Our team utilizes proper safety vest and hard hat use at all times on the job site to avoid preventable injuries. Keeping alert. Not paying attention to your surroundings can have disastrous consequences. Our training focuses on staying alert when working with large machinery. You never work in an operator’s blind spot, and you must always make eye contact with that operator to ensure that you can safely move into their area. Authorized use. One way to keep your site safe is to ensure that your contractors are only using equipment they are trained and authorized to use. In many scenarios, a worker will have experience in one machine and believe they can safely operate the other. Sanilac Steel provides comprehensive training for our employees, and holds strict regulations against unauthorized equipment use. Construction sites are dangerous places. With multiple crews all working at full speed across the site, it’s important to take steps to make sure that your project is completed as safely as possible. Doing so will save you time and money, and it will ensure that all of your workers return home to their loved ones at the end of the day. 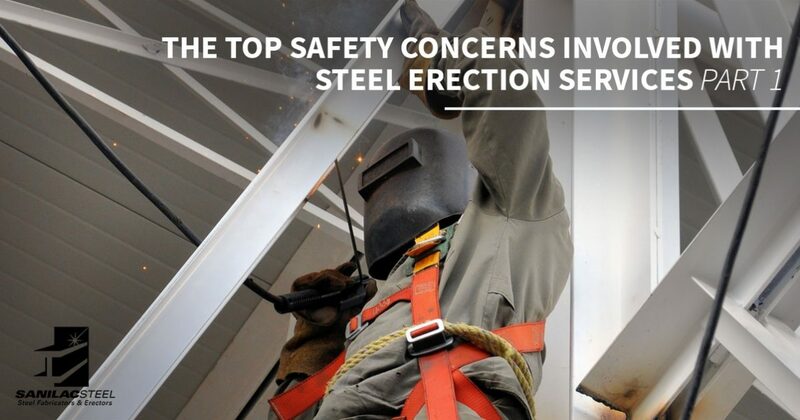 Next time, we’ll continue to highlight the dangers involved with steel erection services. If you’re looking for the safest and most experienced steel erectors in Michigan, be sure to contact us today to learn more about our comprehensive services!